Please help us spread the word on the CF Underground 4 Conf by using one of the methods below. Thanks! 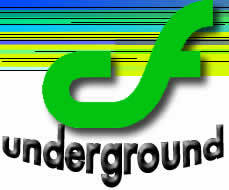 The CF Underground 4 Conference is being held Sun 10/27/02 10:00am - 1:30pm at the Cabana Bar and Grill in Lake Buena Vista, Florida. There are more details at http://www.cfconf.org/cf_underground4/ See you there! Thanks for your help in making this autumn's CF Underground Conf the coolest yet!